Time, space and knowledge are the most basic facets of human experience. They are the Being of our being as it manifests in this world. Space allows the world of objects to appear; time makes possible the sequence of events that gives order to our lives; knowledge gives meaning and significance to whatever appears or unfolds. Time and space are the ordinary stuff of existence, which ordinary knowledge aims to know. Precisely because of their 'ordinariness' — because there is nothing more basic to our reality — time, space, and knowledge can also serve as the gateways to new vision. Knowledge in dynamic interplay with Space and Time can challenge familiar assumptions about self and world, knowing and the knowable. Time can present and Space can allow a new kind of inquiry, revealing Knowledge in a light that illuminates the whole of Being. The world we live in today is in need of a more comprehensive vision that reveals our true relationship with time, space, and knowledge, for it appears as if time, space, and knowledge are becoming unfriendly towards us. Time seems to move too quickly: When we try to match its rhythm in our lives, we find it difficult to 'find the right time', to 'be on time', and to 'catch things in time'. We are always 'running out of time': We simply do not 'have the time' to do everything that we need or want to do. Space is increasingly crowded with the abundance of objects modern technology has created, and this in turn is reflected in the crowded inner landscape of our thoughts and desires. While knowledge continues to subdivide, specialize, and proliferate, we appear to be moving toward less certainty rather than more. The light of knowledge as it is projected from the past into the future has somehow grown dim, and is now powerless to illuminate a clear path of action. We no longer see where the arrow of the future is pointing; we do not know the direction of human destiny. When time is short, space is limited, and knowledge is uncertain, where can we turn? This is a serious situation, for although we can no longer look upon time, space, and knowledge as joyful participants in our lives, we cannot simply turn away from them or 'divorce' ourselves from them. They are an integral part of our lives . . . we could say they are our lives. As human beings, we all participate in the same play; we are all active together. In the course of our lives, we play different roles, developing through space and time. This activity is already the expression of knowledge. Mind engages the quality of knowledge, and we participate in this engagement whether we are aware of it or not. Our lives naturally embody a momentum that unfolds from knowledge as the central truth of our being. A new kind of inquiry would invite a new appreciation of ordinary existence through investigating experience from the perspective of time itself, space itself, and knowledge itself. Instead of looking at objects, we might notice the space in which they appear. Instead of accepting the patterns and positions of the self, we might look at the temporal dynamics of the self in interaction with its world. This shift in attention begins to shift our concern from the content of what is known directly to knowledge itself. When we shift our attention from what is given in experience to the way in which it is given, new facets of time, space, and knowledge are revealed. As we learn to look at the indistinct edges and boundaries of what we know, rather than the impenetrable center, our eyes adjust to a different kind of light, and we see much that we had previously overlooked. New ways of knowing emerge, inviting us to go beyond the structures of thought and the patterns of desire, and discover a far more abundant body of knowledge. Embodied in being, such knowledge manifests spontaneously, without the effort characteristic of thought or the distortion that comes with wanting, and without having to be prepared for in advance. It makes possible action free from obscuration, not bound by judgments and presuppositions about the way things are. It works a change in thinking, character, and being. The unfolding of this inquiry invites Time, Space, and Knowledge to speak for themselves — not simply as facets of 'our' experience, but as interacting dimensions of Being. When we let old patterns of action, perception, Knowledge of Time and Space and understanding drop away, without immediately installing new ones in their place, we begin to acknowledge the creative play of Time, Space, and Knowledge 'before' all interpretation as well as 'within' all experience. Although what is said here necessarily takes a specific form, whatever limits that form imposes can be transcended if the presentation is understood as an invitation to Knowledge to speak, using a language shaped by Time and open to Space. This conversation among Knowledge, Space, and Time requires a new way of speaking. Familiar words must be used in unfamiliar and unexpected ways, and long-established concepts must be given back their power to awaken and expand awareness. The reader can and indeed must join in this conversation, which is also addressed to his or her own 'knowledgeability'. For unless there is genuine listening, the voice of Knowledge cannot be heard. The mind has many patterned ways to prevent this listening and speaking: boredom, easy distraction, bemused reflection, or a steady stream of conceptual insights. Relying exclusively on words and thoughts, judging in terms of previous understandings, accepting uncritically beliefs proffered by others, turning inquiry into game playing, rejecting rigor and precision in the name of 'direct experience' — all these approaches only further habitual and frustrating ways of knowing and being. Even eager acceptance turns out to be a way to adopt another identity or attach ourselves to a school of thought or doctrine. Such an understanding only supports ownership of knowledge and the sterile production of commentaries on what is no longer living. The best test is this: If what is being read does not emerge as a fundamental theme in the ongoing practice of daily life, the project of our inquiry has not been fully taken to heart. We can begin our inquiry with a passionate commitment to what knowledge can accomplish. Not content to explore on the level of ideas, we can live out and embody the unfolding inquiry in the way that we now live out ordinary understanding, ready to further knowledge in ways that further human being as well. Alive to the possibilities of Time, Space, and Knowledge, we can invite the truth of what presents itself to address us with a voice that has long gone unheard, but has never fallen silent. At first we will engage this invitation through language and linear presentations. Later, it may be in discourse with others committed to the same inquiry and actively participating in the ongoing invitation that we hear what has gone unheard. Eventually, we can learn to hear this voice in the sounds that resonate throughout our world. If we are mindful, we can learn to recognize it even in the cacophony of voices that wells up from moment to moment, naming, shaping, judging, and defining conventional reality. We might say that Time, Space, and Knowledge have their own 'order', which gives rise to a purpose that can in turn be expressed within knowledge, space, and time. There is a 'truth' appropriate to this purpose, even though that truth cannot be specified in any ordinary sense. To misappropriate or deny that 'truth' which comes to our awareness will undermine the vision of our own experience. The Time-Space-Knowledge vision is one of transmutation. It carries within it the specific energy inherent in transmutation. When this energy is activated, attempts to 'appropriate' the vision or carve it into manageable pieces could turn in negative directions, giving a counter-productive, even explosive reaction. We can safeguard our inquiry by an attitude that is open and vigorous. It is not important to 'understand' all that is said here; it is enough to be open to each question as it arises, and to persevere through uncertainty or discomfort. Difficulties arise only if the material presented is approached merely through labeling, incorporating, and storing away. The alternative is to investigate the Time-Space-Knowledge vision with active intelligence. Knowledge itself is the best friend of intelligence. It can be our eyes and ears, our leader and our shelter. Human beings have achieved so much with knowledge; now we too can join in the unfolding of a knowing that develops through the activity of time into the openness of space. Knowledge is not the property of anyone, and this presentation should not be considered exclusive. Others might find a completely different and more effective way of exploring the vision, drawing on a different vocabulary and style and engaging whole new realms of discourse. For knowledge itself is not secretive or reluctant to appear, nor does it disclose itself only to a chosen few. It is only our insistence on limitations that closes knowledge off. Whatever counteracts this tendency toward limits makes knowledge more freely available, bringing benefits to everyone. If we let the search for knowledge become the play of time and space, we will find that the clarity of inquiry merges with the freedom of time and the openness of space. Time, Space, and Knowledge 'take form' in such a way that no one takes, nothing is taken, and no form is established. As they appear in the light of inquiry, they invite a knowing that deepens and expands in a dynamic of celebration. For too long we have turned our backs on our human potential, until we have forgotten that there are any other possibilities for being. Now let us turn instead toward Knowledge, as the who of our being and the how of our action, the where of our becoming and the why of our existence. Alive to knowledge, we can commit ourselves to living in accord with the truth emergent in time and space, and discover for ourselves and others the meaning of our full potential. Let us imagine Knowledge boundless in its prospects, welling forth in waves, resonating throughout the universe, expanding beyond its parents, Time and Space. Let us ask Knowledge to sustain and nourish us, sweeping us up in a beauty that feeds our hidden hungers and shelters our most noble aspirations. As we begin our inquiry, let us imagine that we are donning the silken robe of Knowledge, a coat of many colors — a magical garment that gives us warmth, comfort, aesthetic delight, and a sense of deep refinement. Elegant and Luminous, Knowledge of Time and Space celebrates active participation in boundless creativity. Sparkling like a jewel, this vision reflects the light of knowledge that opens new perspectives on ordinary experience. Exploring it's many facets, readers of different backgrounds will discover countless starting points that lead to liberating knowledge. Tarthang Tulku is renowned as a visionary, independent thinker and also as an innovative teacher. Educated in the Buddhist tradition in Tibet, he has been writing and teaching in America since 1969. His extensive publishing and educational projects have influenced leaders in the fields of philosophy, science, psychology, education, and business. 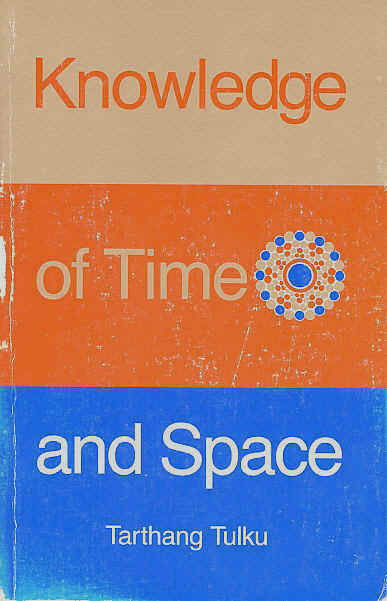 Time, Space, and Knowledge — A New Vision Of Reality, was first published in 1977. Now in its fourth printing and available in over one hundred courses in colleges and universities worldwide. Love of Knowledge, published in 1987, opened a rigorous analysis of the vision, while Knowledge of Time and Space illuminates its beauty and clarity.